SG-1 arrives through the Stargate in a room filled with advanced-looking technology. 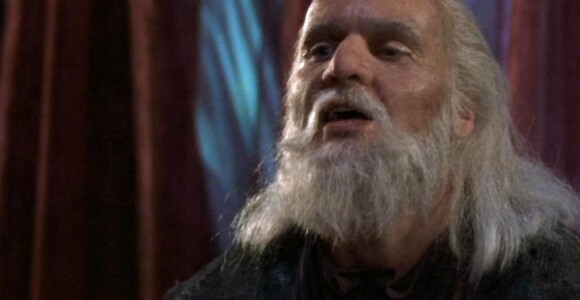 They are greeted by an elderly man — Ma’chello — who has been hunted by the Goa’uld for many years because of his efforts to develop technology to fight them. He shows Daniel one device. But after they each grasp the handles of the strange object, Ma’chello falls down, unconscious. The team brings the old man back to Earth, where Dr. Fraiser determines that he is near death. As for Daniel, he isn’t exactly acting like himself. General Hammond sends him home for the day. Back in the infirmary, Ma’chello has regained consciousness, and is claiming to be Daniel Jackson. He demonstrates this by answering questions only Daniel would know, and tells SG-1 that the machine has somehow switched his consciousness with Ma’chello’s. The real Ma’chello, now in the body of Daniel Jackson, wanders the streets of Colorado Springs trying to learn about Earth culture and customs. He comes upon a homeless man, Fred, and invites him to feast at a local diner. In fact, Ma’chello is anxious to celebrate his new life and his “strangeness,” and invites the whole restaurant to “feast” on Daniel’s credit card. Daniel is left to die, trapped inside of Ma’chello’s aged, scarred body. To try and reverse the transference, should Ma’chello be found, the rest of SG-1 returns to Ma’chello’s planet to retrieve the device. Carter is intrigued by his technology, and hopes to find something to help her in deciphering the symbols in Ma’chello’s notes. The team’s safety precautions are not enough, though: Teal’c and Colonel O’Neill switch bodies. They manage to bring the device back to the S.G.C., but Carter cannot find a way to reverse the process. Teal’c — or rather, O’Neill in Teal’c’s body — comes down with an illness. Teal’c must show O’Neill how to enter kelnorim — a deep meditation — in order to allow his Goa’uld symbiote to heal Teal’c’s body. If O’Neill cannot do this, Teal’c’s body will die, along with O’Neill’s consciousness. Jack is successful in reaching the deep meditation, and Teal’c’s body is eventually healed. Meanwhile, local police have tracked Ma’chello to a diner through Daniel’s credit card. Fred watches helplessly as they arrest his strange new friend. At the S.G.C.’s infirmary, Ma’chello looks upon his old body with disdain, and states that he will not undo the change — that he can’t. He designed the device to encode each transference, so that it could not be undone. Ma’chello tells them that he took Daniel’s body because he deserves it. He has been hunted for decades, captured and tortured, and spent his whole life creating technology to fight the Goa’uld. Without his lifetime of work and sacrifice, Ma’chello says, Earth and many other worlds would have been conquered long ago. It is the least they can do, he tells them, to compensate him with a new life. 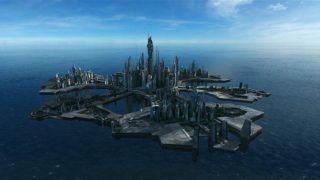 Ma’chello attempts to bargain with them, asking them to exchange Daniel’s body and his freedom for all of his knowledge and technology — with which they will be able to not only defend themselves against the Goa’uld, but perhaps even defeat them. Ma’chello is moved by Daniel’s words, and tells Carter that he would trade places with Daniel if it were possible — but he is the only one who cannot. This gives Carter an idea. Ma’chello and O’Neill trade bodies, then Teal’c and Daniel. Jack and Daniel are then able to trade places and return to their own bodies, as are Teal’c and Ma’chello. The device would not allow Ma’chello and Daniel to trade, but would allow them to trade with the others. Ma’chello has been a fugitive from the Goa’uld System Lords since before Teal’c was born. He was captured and tortured, and marked by the System Lords to become a Goa’uld host so that his knowledge could be retained. Before the ceremony of implantation, Ma’chello killed several Jaffa and escaped. Teal’c felt that he had to shave his (O’Neill’s) head. Perhaps this is a Jaffa social or religious rite, required of him by tradition. It may also simply be Teal’c’s personal preference. After fighting the Goa’uld for 50 years, Ma’chello was betrayed by his own wife, who had been secretly turned into a host. He also lost his world: 2 billion of his people died rather than turn him over to the Goa’uld. Cassandra (“Singularity”) is 12 years old. “Kelnorim” is the name of deep form of Jaffa meditation. It is like a “waking sleep,” where the person dreams, and the human subconscious becomes one with the symbiote’s subconscious. Daniel Jackson – Daniel experienced several hours trapped inside the body of a dying man, while Ma’chello stole his own body. (Perhaps he now has a small idea of what his wife, Sha’re, is enduring as a host to a Goa’uld.) The transference will likely have a lasting effect on Dr. Jackson. Daniel does not have any sisters. Teal’c – To allow his symbiote to combat particularly nasty illnesses, Teal’c must enter Kelnorim — a deep meditation. Failure to do so in such circumstances can lead to his death. One of Teal’c’s first assignments as First Prime of Apophis was to hunt Ma’chello. How long had Ma’chello been in hibernation before being discovered by SG-1? Did the S.G.C. retrieve any of Ma’chello’s anti-Goa’uld technology after his death? What advantages might these devices have for Earth in the future? How did Ma’chello’s transference device remap the brains of Teal’c and O’Neill, in spite of their precautions? Is the transference electrically induced? Did Ma’chello literally save Earth from being invaded by the Goa’uld years ago? Will there be any lasting physical or mental effects for Daniel, Teal’c and Jack? VOTE! How would you rate SG-1's "Holiday?"